Guest post by Mathew Lippincott. Originally posted on Mediashift’s Idea Lab. Detritivores are creatures that consume decaying matter. Detritivore designs use abundant waste products to make scalable technology solutions. Unlike loftier concepts of zero-waste design such as Cradle to Cradle, Detritivore design accepts that the world is already loaded with discarded and broken technology. Detritivore designers need not create a recyclable or even non-toxic product, since the materials already exist — we merely try to squeeze out whatever functionality objects may have left. The Public Lab Spectrometry Kit is a detritivore design. 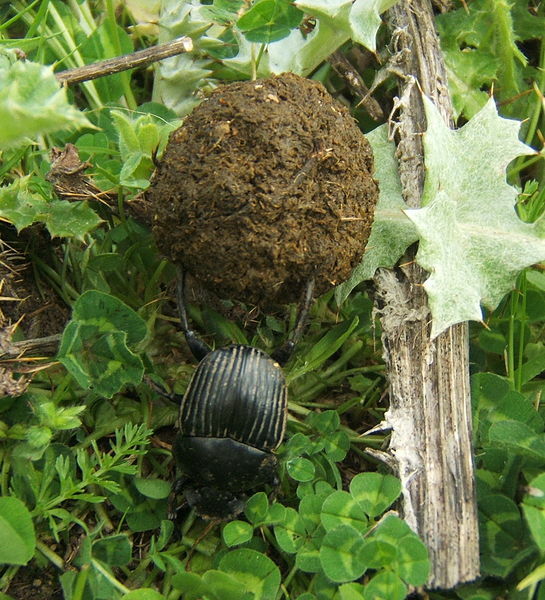 It consumes waste products and uses them to search for other, more dangerous wastes. Pipe cutoffs, obsolete webcams, and optical discs are sufficient to make a functioning spectrometer. 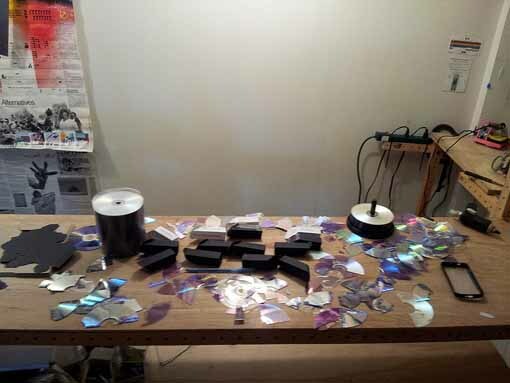 The central component, the diffraction grating, is made from CDs and DVDs, disposable media with extremely precise grooves. Long after the media written onto these discs decays into illegibility, they will still function as diffraction gratings, splitting light into a rainbow that can be quantified and used for material identification. 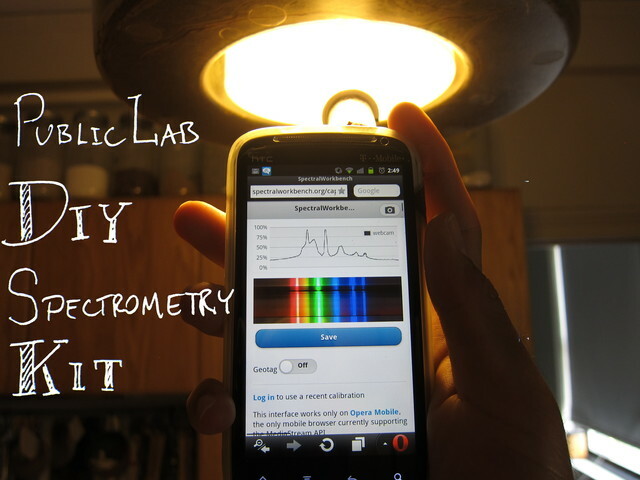 A DIY kit from The Public Laboratory helps analyze materials and contaminants. Real detritivore design. We’ve made spectrometer plans, sell kits, and have created Spectral Challenge, an X-Prize-style competition to identify environmental contaminants. We are dedicated to this project’s continuity, but with over 200 billion CDs and over 1 billion DVD players in the world, it is unlikely that we will ever run out of hardware. Our design patterns ensure that optical disc spectrometry can outlast any one project or manufacturer. With over 200 billion CDs and over 1 billion DVD players in the world, it’s unlikely that we’ll ever run out of hardware. There are commercial diffraction gratings that we could use, and they would simplify the construction of our retail kits a little bit, but they wouldn’t significantly increase the accuracy of our device. Doing spectroscopy with consumer detritus is more important to our scientific program than simplifying our kits. We mail kits around the globe, but mail can’t reach all the places thatDVDs and CDs already have. Detritivore design affects the permanence of trash as a badge of hope rather than dismay; we need never worry about losing access to our science equipment. We’re developing a platform on top of ubiquitous trash, using its persistent nature to escape the ephemerality of the startup culture in which we design. It is time to naturalize trash as a set of unique design materials valuable as more than just raw materials for new things or kitschy aesthetic references to previous eras. Reach into the trash can. Minimizing or eliminating non-reusable and non-biodegradable elements in designs is laudable, but we should put more effort into designing around the persistent functionality of objects whose primary purpose has failed. It’s time to stop hiding trash and start living in it,” studying it,”:http://discardstudies.com/ and embracing the roughly 1 million pounds per person per year for the average North American creates. Our dialogue on waste has shifted from disposal, displacement, and dilution towards minimization and elimination, but we need to move beyond a false hope that we will escape waste and towards an intimacy with our culture’s primary product: broken junk. Mathew Lippincott is of the opinion that the future needs better instructions. An artist and designer working in technology development & education, he splits his time between creating low-cost science kits and restroom reform. A founding member of the Public Laboratory for Open Technology and Science (Public Lab), and MDML design, Mathew’s recent life highlights include his Balloon Mapping Kickstarter being listed as one of the 10 best projects of 2012, MDML’s Sewer Catastrophe Companion being exhibited at the Center for Disease Control and approved by the Portland Bureau of Emergency Management, and developing signage for theBeacon Food Forest in Seattle. This entry was posted in Art, Environment, Methods, Reuse and tagged broken technology, citizen science, consumer detritus, Detritivore designs, DIY, Environment, maker culture, science, technology, toxics. Bookmark the permalink.